Bakersfield Memorial Hospital has announced a new President and CEO, Ken Keller. Keller was the COO of Memorial Hospital for the last four years. BAKERSFIELD, Calif. — Bakersfield Memorial Hospital has announced a new President and CEO, Ken Keller. 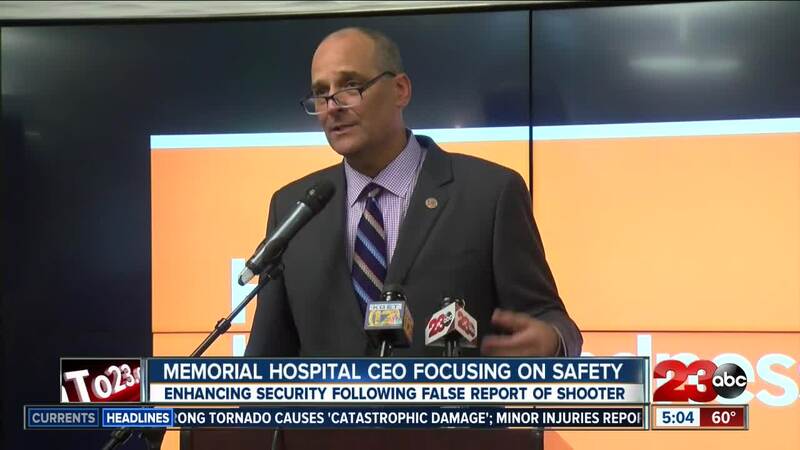 Keller was the COO of Memorial Hospital for the last four years and will be replacing Jon Van Boening, who accepted a full-time position as President and Senior VP of Operations for Dignity Health Central California. "As we position Memorial and Dignity Health in Bakersfield, the healthcare landscape is changing. We have to take that legacy and future thinking and build to meet the need of today's community with the understanding that tomorrow is going to change a little bit and be on the forefront so that we are ready for the change as it happens," said Keller. On December 24th, reports of a potential active shooter set all emergency responders into action. The Bakersfield Police Department said, 46-year-old Mario Thompson disguised himself as a security guard and made the false report from inside the hospital. Keller says since that event, the hospital has had four briefings to discuss ways to improve overall safety. Keller says they will not only focus on new advanced surgical technology and enhancing patient care but training for emergencies by improving communication, response times, safe zones and facility security. Keller said the hospital is currently working with law enforcement to create a communication technology plan to stop prank, false and unauthorized calls. There is no confirmation when the technology with be implemented but Keller says the staff will continue conversations on safety.